A neat Sterling Silver Golf Bag Keyring with golf clubs, bag and side pocket. Lots of detail. Presentation Box. A lovely novelty keepsake gift for golfers. A Golf Club Tie Slide with golf club and ball. Boxed. A top quality, luxury silk faille tie with multiple golfers in swinging pose in stitched motifs on a navy tie. Made from the finest English silk. 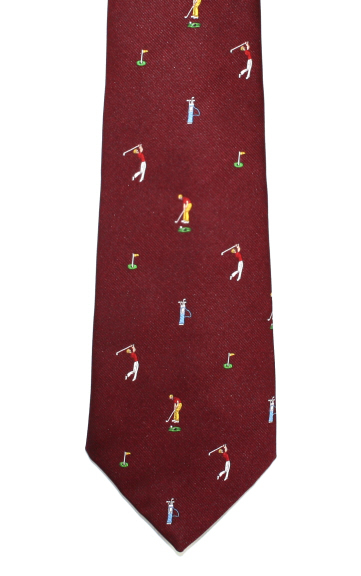 A luxury silk faille tie with multiple golfers in swinging pose in stitched motifs on a red tie. Made from the finest English silk.